An Amazing Day at Wiltshire Floor and Vault….! 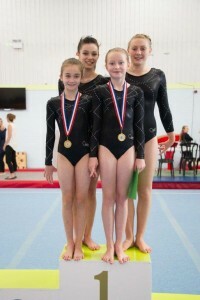 WWG had a fantastic day at the Wiltshire Floor and Vault Competition on Sunday 2nd October. Out of 23 WWG gymnasts, we won 13 medals, including 7 Golds, across a range of categories and age groups. Left to right: Back row – Calum Duncan, Armand Weissel Hetzel, Sam Rickard, Sam Veall, Ollie Poole, Oscar Grieve, Sam Duncan, Alex Rickard. Middle Row – Brayden Leitch, Talia Brown, Mia Pardoe, Tabitha Coleman, Isabelle Kerbey, Tabitha Olivier, Mya Brown. Front Row – Eliza Blackmore, Grace Till, Ava Britten, Jasmine Stone. Left to right: Back row – Georgia Smith, Catherine Hall. Front row – Hannah Ovens, Jessica Richardson. Congratulations to all the gymnasts, coaches, parents and judges! Copyright © 2014 www.wwesprit.com. All rights reserved.